First Appearance: Captain Victory and the Galactic Rangers #3 (back-up story, Pacific Comics); Ms. Mystic (Continuity Comics); Death Watch 2000. 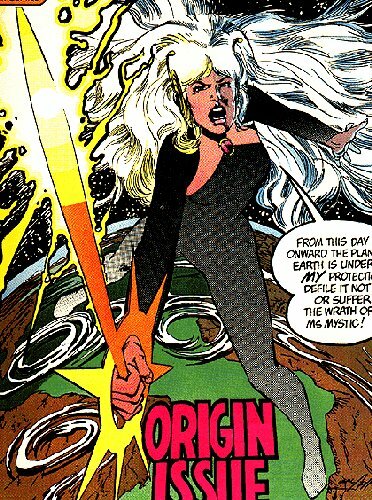 History: The woman who would become known as Ms.Mystic was a witch who guarded Earth in centuries past, until someone tried to burn her at the stake. To escape she threw her essence into another dimension, where it stayed until she was summoned back in modern times, when a team of S.I.A. agents used an experimental "psionic converter" which shifted from our reality into the psychic plane. When it returned, it had picked up Ms.Mystic as a hitch-hiker. Her main priority is protecting the environment and nature, though she will save people too if it doesn't get in the way of her achieving her main goals. Having been injured in battle, Ms.Mystic called on Mother Nature to lend her aid, and so Mother Nature created the Elementals who later took the name Urth 4. Comments: Thanks to Bruce Reville for informing me of the correct first appearance of this character.